Notes: Fiholm Manor is a Landed Estate located approximately 20 km West of Eskilstuna in Eskilstuna Municipality, Sodermanland County, Sweden. It is privately owned. The Landed Estate of Fiholm was commissioned by the Swedish statesman Axel Oxenstierna in 1640 to the plans of the French architect Simon de Vallee. The two standing buildings (wings) were drawn up in a French-Dutch Renaissance style and completed in 1642, representing some of the finest kept examples of fine Swedish architecture of that period. 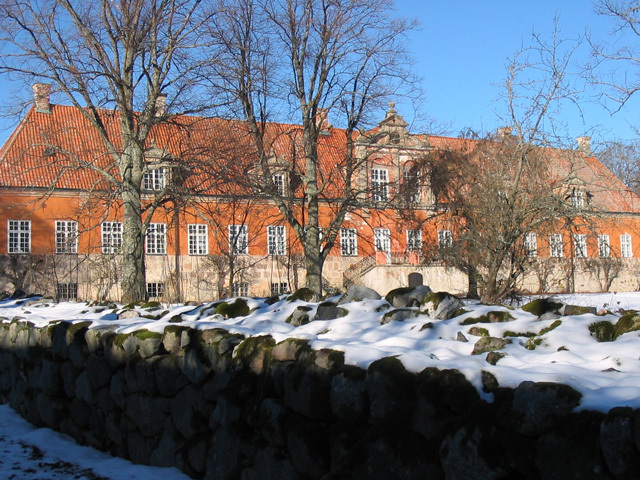 Construction works at Fiholm were overseen by the elder Nikodemus Tessin, then only 25 years old, and the intention was that the two standing buildings should become wings to a magnificent stately Manor House. Sadly the Manor House was never realised. The nearby located Jaders kyrka (Jader Church) was built by Oxenstierna at the same time, and can through its grandeur indicate what might have been. Jaders kyrka remains to this day the burial church for the Oxenstierna family.